Please join our Scifi Mailing list to get Buffy and Angel news in your mail! “Buffy the Vampire Slayer” is nominated for a Teen Choice Award for Throwback TV Show (#ChoiceThrowbackTVShow). Vote Now! The show Airs Sunday, August 13, LIVE on FOX. Former Buffy producer/writer Drew Goddard has has created "Marvel’s Daredevil" on Netflix. It's fabulous! Check it out. Buffy and Charmed actors reunite! PIVOT TO AIR "BUFFY THE VAMPIRE SLAYER" MARATHON THIS VALENTINE'S DAY! Calling all lovers! This Valentine’s Day, Pivot is bringing you a special gift: a mystical marathon with the most lovable, yet daring, vampire slayer there is—Buffy. Airing on Sunday, February 14th, starting at 9:00am ET, Participant Media’s television network, Pivot, will air a “I Heart Buffy,” 13-hour marathon featuring the complicated love story of one of pop culture’s most beloved couples. Whether you’re snuggled up with your sweetheart or celebrating with friends, be sure to enjoy some quality time with Buffy and her gang as they slay the forces of evil all day long. From Buffy and Spike’s first meeting to planning their big day, this marathon features episodes about their love story. Take a bite out of “Buffy the Vampire Slayer” starting at 9:00am ET this Valentine’s Day only on Pivot. Buffy writer and executive producer Marti Noxon created the great new show "Unreal" on Lifetime about life behind the scenes at a "Bachelor"-like show. POP CULTURE ICONS DAWSON LEERY AND BUFFY SUMMERS ARE COMING TO ABC FAMILY, BEGINNING MONDAY, JUNE 22nd Hit Dramas “Dawson’s Creek” and “Buffy the Vampire Slayer” Join The Network’s Weekday Lineup ABC Family Kicks Off Their Runs by Giving Fans the Chance to Vote for Their Favorite Episodes Burbank, CA (June 9th, 2015) – What do an aspiring filmmaker and a vampire slayer have in common? Not only are they two teens trying to navigate their way in the world, but both are making their ABC Family debut on Monday, June 22nd, 2015 at 12:00PM ET/PT and 5:00PM ET/PT, respectively. Before Dawson, Buffy and all their friends make their first network appearance, fans will have the opportunity to visit http://abcfpoll.com/ and vote for their favorite “Dawson’s Creek” and “Buffy the Vampire Slayer” episodes to kick off each series’ respective runs. The ten episodes chosen by the fans will air during “Fan Favorite Week,” beginning on Monday, June 22nd at 12:00pm. Should “The Longest Day,” that game-changing episode when Joey and Pacey tried to tell Dawson about their romance, make the cut? Or what about “Becoming – Part Two,” when Spike strikes an unholy alliance with Buffy in order to keep Angel from destroying the world? Now’s the chance for viewers to speak up and be an active part of ABC Family’s programming! Then starting Monday, June 29th, both shows air from the beginning with “Dawson’s Creek” at 12:00 – 1:00 p.m. ET/PT and “Buffy the Vampire Slayer” at 5:00pm-6:00pm ET/PT. Dedicated fans who tuned in for the shows’ original runs can relive and debate the Dawson/Joey/Pacey and Angel/Buffy/Spike love triangles all over again, or join their favorite characters on a trip down memory lane as they tackle the trials and tribulations of adolescence – some without the added burden of being a vampire slayer. For those that missed each series the first time around, ABC Family offers the perfect chance to tune-in and fall in love with the characters and storylines that made pop culture history. Vote for Sarah Michelle Gellar for a People's Choice Award! You can vote over and over, so please do! This past Sunday, Danny Strong (Jonathan) won the Outstanding Writing Emmy award for Miniseries/TV movie, for Game Change. Will Joss Whedon's Avengers success allow him to deliver on the long-awaited Buffy the Vampire Slayer movie? And would (former) Ringer star Sarah Michelle Gellar be on board to return to her demon-defeating roots? From Entertainment Weekly: It's been eight years since Buffy the Vampire Slayer's Sarah Michelle Gellar bid adieu to the show that made her an icon to focus on making movies. After giving birth to her daughter in 2009, she began looking for a TV project that could keep her in Los Angeles, where she makes her home with hsuband freddie Prinze Jr. "At the same time," says Gellar, 34, "I was up against this wall: What do you do after Buffy?" The answer isn't short on ambition. On Ringer, Gellar plays twin sisters: Bridget, an ex-stripper on the run from the Mob, and Siobhan, a high-society snoot with a resentful husband (loan Gruffudd), a possessive lover (Kristoffer Polaha), and many secrets. When Siobhan goes missing, Bridget tries to escape her troubles by taking over her sister's identity. Instead, both their lives become more complex. "It encompasses everything I want, professionally and personally," says Gellar, adding that she enjoys playing opposite herself quite a bit. "My costar? Always knows her lines, always hits her marks, and never gives me attitude. Genius! Every actor should try it." (The CW) Sept. 13, 2011. From tvline.com: In news that just made our entire summer, former Buffy producer Jane Espenson and Life Unexpected creator Liz Tigelaar have joined the already stellar team behind Once Upon a Time, the new ABC drama that already boasts two former Lost producers as EPs. Both female powerhouses tweeted the news over the past few weeks, but The Hollywood Reporter reveals how exactly they’ll be contributing to the fantastical project: Espenson will co-executive produce, and Tigelaar is a consulting producer. Michelle Trachtenberg guest-starred on "Love Bites" on NBC. Michelle explains the mighty impact of banana bread. sure to tune-in tonight at 10/9c for all the fun. Jeffrey Tambor and Michelle Trachtenberg. Eye contact is what makes it special. That's right, friends buy friends lap dances. Jim Kouf ("National Treasure," "Angel") and David Greenwalt ("Buffy the Vampire Slayer," "Angel") are the creators/executive producers of a new NBC Fall series "Grimm". Poll: Which big-name star are you most excited about returning to TV? Vote for Sarah Michelle Gellar! NEW YORK – January 13, 2011 – Writers Jane Espenson and Drew Z. Greenberg are teaming to pen the script for Syfy’s pilot development project Randall and Hopkirk (Deceased) from ITV Studios America. Syfy announced last May that it had acquired the rights to the classic British detective show for development as a potential one-hour series with Howard Braunstein of Jaffe/Braunstein Entertainment (The Memory Keepers Daughter/ Christmas in Canaan) on board as executive producer. Randall and Hopkirk is a co-production between Universal Cable Productions and ITV for Syfy. UCP will be the producing company. Jane and Drew most recently collaborated on the Syfy original series Caprica, where Espenson served as executive producer and Greenberg as supervising producer. The pair also worked together on genre busting crossover television hit Buffy the Vampire Slayer where Espenson was a writer/producer and Greenberg a writer. Espenson’s other writing and producing credits include Battlestar Galactica, Gilmore Girls and Dollhouse. Greenberg’s writing and producing credits include Warehouse 13 and Dexter. Randall and Hopkirk (Deceased) is based on the popular British detective series from the late 1960s in which Hopkirk (Kenneth Cope) was murdered while investigating a case. He returned as a ghost, visible only to his former partner, Randall (Mike Pratt), and assisted him in sleuthing from beyond the grave. ITV Studios America, the U.S. based production entity of ITV plc in the U.K. is one of the largest international producers for the U.S. market and a major force in acquiring, developing and producing reality and scripted programming for US networks. ITV Studios, Inc., is a world leader in television production and distribution, with international production centers in the UK, Germany, Australia, France, Spain, and Scandinavia as well as America and programs distributed to over 155 territories worldwide. Universal Cable Productions creates quality content across multiple media platforms for USA, Syfy and other networks. A leader in innovative and critically acclaimed programming, UCP is the studio behind USA's Royal Pains, Law & Order: Criminal Intent, Psych, In Plain Sight, Covert Affairs and Fairly Legal, as well as Syfy's Eureka, Warehouse 13 and Alphas . The studio also produced the long-running series Monk and Battlestar Galactica, as well as the series Caprica. UCP is a division of NBC Universal. From Twitter: CHECK IT OUT! If each person here donated 5 CENTS to: http://bit.ly/g7SxKr WE WOULD REACH OUR GOAL! Got a nickel for your Dushku...? From Suzanne: I donated $25, how much will you give?? Bid on an auction (proceeds go to help Haiti) and a celebrity may choose to follow you on Twitter, thank you on her Twitter, and send you other prizes! More info at http://www.twitchange.com Bidding ends 9/25/10. Includes Allyson Hannigan (Willow), Eliza Dushku (Faith) and more! Go to ebay and type in "twitchange" and you will get a list of all of them. Sarah Michelle Gellar (Buffy) had a baby. 'Buffy' Star James Marsters Engaged! A 'Buffy' movie without its maker? Joss Whedon speaks out! Joss Whedon's new online musical: Dr. Horrible's Sing-a-long Blog It's awesome!! Eliza Dushku (ex-Faith) is dating "Family Guy" creator Seth McFarlane. According to Entertainment Weekly, Sarah Michelle Gellar has a new movie, a romantic comedy "Suburban Girl", but they are looking for a distributor. 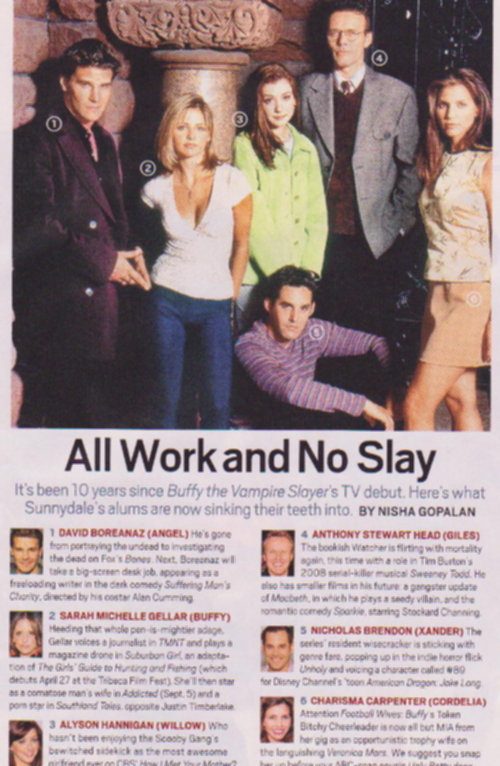 This Entertainment Weekly article tells what the Buffy cast is up to now! Former "Buffy the Vampire Slayer" regular Michelle Trachtenberg will try out her comedy chops at ABC. The Alphabet has added the actress to its untitled Washington-set comedy, according to The Hollywood Reporter. Another "Buffy" veteran, Kali Rocha, has meanwhile signed onto ABC's "The Call," as has Kal Penn. The network has also added Adam Goldberg to its drama "Marlowe." Trachtenberg will star opposite Eric Christian Olsen ("The Loop") in the D.C. comedy. She'll be playing the daughter of a lawmaker who falls in love with Olsen's character, who just happens to work for her dad's nemesis across the aisle. Trachtenberg played Buffy's sister Dawn for three seasons on "Buffy the Vampire Slayer." More recently she's starred in the movies "Black Christmas" and "Beautiful Ohio" and made guest appearances on "House" and "Law & Order: SVU." In "The Call," a comedy about a group of L.A. paramedics, Penn will play a hypochondriac member of the team, while Rocha will play the group's boss. The show's cast also includes Jodi Lyn O'Keefe, John Francis Daley and Danny Comden. Penn appeared on several episodes of "24" this season; that show's producers are also behind "The Call." Rocha, who had a recurring part as the demon Halfrek on "Buffy," currently plays chipper attending physician Sydney Heron on "Grey's Anatomy." On the drama side, Goldberg will star opposite Jason O'Mara and Amanda Righetti in "Marlowe," a contemporary take on the Raymond Chandler private eye. He'll play an LAPD detective who occasionally helps Marlowe (O'Mara). Goldberg is currently on the big screen in "Zodiac." His other credits include FOX's "Head Cases," "Deja Vu" and "Dazed & Confused." As the 2008 presidential campaign ramps up, HBO is looking back at the last time the United States replaced a two-term president. The cable network has greenlit "Recount," which will dramatize the events surrounding the hotly contested Florida recount in the 2000 election. Oscar-winning director Sydney Pollack ("Out of Africa," "The Interpreter") has signed on to direct the film, which was written by "Buffy the Vampire Slayer" and "Gilmore Girls" actor Danny Strong. Casting hasn't begun yet, but HBO is aiming for a spring 2008 airdate, the showbiz trade papers report. The script is the first by Strong, who currently plays Paris' (Liza Weil) boyfriend Doyle on "Gilmore Girls." He did extensive interviews with people involved in the recount before writing the script, which, both HBO Films chief Colin Callender and producer Paula Weinstein ("Blood Diamond," HBO's "Truman") say, plays things down the middle by focusing on the backstage drama of the recount. "It's a fascinating look at democracy where the rubber meets the road -- a look at the election process like we've never seen it before," Callender tells The Hollywood Reporter. Pollack won an Oscar for directing 1985's "Out of Africa," which also earned best picture that year, and was nominated for "Tootsie" a few years earlier. His other credits include "The Firm," "Three Days of the Condor" and the documentary "Sketches of Frank Gehry." 2/13/06 - Alyson Hannigan is in a new movie titled "Date Movie" scheduled to open February, 17. 2/13/06 - Seth Green turned 32 on February, 8. 2/13/06 - Sarah Michelle Gellar has filmed a movie titled "The Return" which is scheduled to open in early September. 2/13/06 - Sarah Michelle Gellar is to make a cameo appearance in the sequel to "The Grudge" titled "The Grudge 2". 2/13/06 - Sarah Michelle Gellar is working on a new projected titled "The Air I Breathe" which started filming in January. 11/30/05 - Seth Green (Oz from Buffy) will be starring in a new show titled "Four Kings" on NBC. The show is scheduled to premier Sunday January, 1 2006. 11/28/05 - James Marsters (Spike from Buffy and Angel) is currently appearing on the WB's hit show Smallville as Superman's nemesis. 11/28/05 - Marti Noxon (executive producer of Buffy) recently said that the characters of Buffy may live on in direct to DVD movies. Talks of bringing some of the characters back are being discussed. 11/28/05 - Sarah Michelle Gellar will be playing the role of Krysta Now, an adult film star making her own reality show in the movie titled "Southland Tales". The Rock and Seann William Scott will also be appearing with Sarah in the film. Filming began this August. Alyson Hannigan currently stars in the new show "How I Met Your Mother" on CBS. Six of the stars of the show will be on new shows this fall! Buffy creator Joss Whedon's film "Serenity" comes out in September. This is based on the great scifi tv show "Firefly". Former Angel and Buffy writer Marti Noxon created the supernatural soap opera "Point Pleasant", which aired on FOX Wednesday nights. 1/18/05 - Sarah Michelle Gellar will start filming a new movie titled "Revolver" in early march of this year. Sarah has also signed on for a sequel to "The Grudge". 1/18/05 - Alyson Hannigan was signed on to appear in 6 episodes for a midseason replacement comedy on ABC titled "In The Game" also starring Jennifer Love Hewitt but has apparently backed out. 1/18/05 - Nicholas Brendon will be attending several Buffy conventions this year. 1/18/05 - James Marsters will be appearing at a Houston Vulkon convention in April. He will also be doing an acoustic tour in the U.K. in April. 1/18/05 - Michelle Trachtenberg has starred in a new movie titled "Ice Princess" due out in March. 1/18/05 - Emma Caulfield recently finished co-producing and acting in her own independent mockumentary titled "Bandwagon". 1/18/05 - Amber Benson has an untitled independent film currently in pre-production. 1/18/05 - Eliza Dushku will not be returning for a second run in "Tru Calling". The show has reportedly been cancelled. Six episodes that were filmed will air but the dates are unknown. 1/18/05 - Anthony Stewart Head will be attending several conventions starting in April. 1/18/05 - Seth Green will be creating a new show for Cartoon Network's Adult Swim coming next month.